This is a full time position within an abstinence based, addiction outpatient treatment agency in Victoria, BC, the core functions of which include Intensive Outpatient Treatment, case management and 1:1, family and group counselling for people with a variety of addictions, other behavioural health challenges and mental health conditions. The successful candidate will join our small group of respected and accomplished professionals who have extensive experience with the skills to provide the right level of support and direction throughout the recovery process. Our culture is one of mutual respect, compassion, professionalism and commitment. We recognize there is no one-size-fits-all approach to addiction recovery, so we offer a range of options to meet individual circumstances. The candidate will provides screening, assessment, referral, case management, recovery management and counselling services to individuals affected by addiction and co-occurring disorders as well as facilitating psycho-educational presentations and therapy groups. This position requires some evening group facilitation work. The appropriate candidate will work closely with a small team of professionals and have excellent communication skills. There will be opportunities for ongoing professional development. Conduct screenings and assessments, determine appropriate level of care, develop treatment plans and make referrals to programs or external services and resources as required. Develop and implement treatment plans using sound therapeutic counselling techniques. Provide a range of counselling and education services including to individuals, groups and families. Provide on-going evaluation of client’s progress, revise treatment plans as required and provide follow-up planning. Deal effectively with addictive patterns of behaviour, concurrent disorders and other mental health behavioural and emotional concerns such as abuse, violence, grief and loss. Coordinate and/or participate in in program planning activities. Assist with the planning and implementation of program enhancements. Accommodate referrals and admissions into the IOP and aftercare programs. Manage a caseload of clients with a variety of behavioural health and addiction-related problems. Provide psycho-educational presentations as per IOP program modules. Provide education and counselling support to families affected by addiction. Provide feedback and support to clients. Assists clients to develop effective relapse prevention and recovery resilience skills. Participate in frequent consultation and collaboration with other staff and weekly case consultation group. Provides accurate reports to the program director as required. Participate in overseeing the day-to-day operation of the programs by ensuring that program guidelines and policies are adhered to and program standards are met. The Addictions Counsellor will be well regarded for their expertise with the proven ability to build and maintain professional, long-standing relationships with many other service providers, the client, internal team and all stakeholders. Their experience and education allows them to fulfill the requirements of the position as listed above, uphold best practices within the field and have the knowledge and ability to consistently ensure that people receive the right help at the right time. 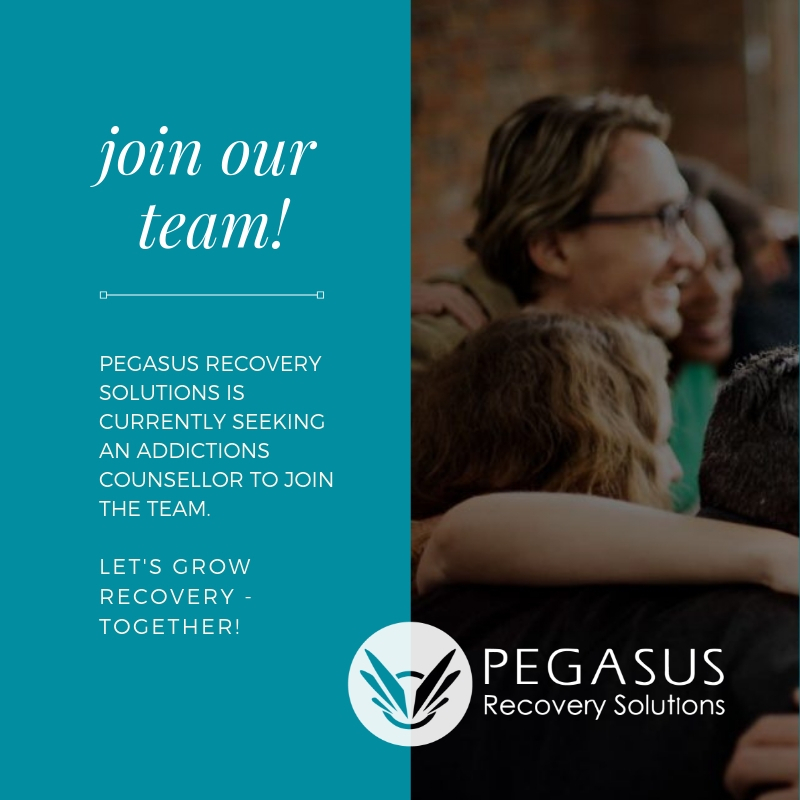 Pegasus Recovery Solutions Ltd. provides team support, excellent communications with a commitment to one another, the client, and others within the field of mental health and addictions. At Pegasus Recovery Solutions Ltd. we value a collaborative approach and each member of staff has opportunity to provide input and feedback to create the best possible environment for our team and clients. Masters in Social Work or Counselling plus minimum 2 years recent relevant experience. Registration with appropriate professional body. CCAC or ICADC or willing to obtain within 3 months of start. Sound knowledge of addiction as per ASAM definition. Sound understanding of the process and stages of addictions recovery and levels of support required at each. If personal recovery is part of experience minimum 5 years required. This position requires a clean criminal records check with the vulnerability sector. Please submit resume with cover letter to – Sue Donaldson, Director via email or by fax 250 294-6850. No phone calls or office visits please. Due to the high volume of applications received, only short listed applicants will be contacted.